True outdoorsmen have a deep-rooted sense of responsibility to care for the land they own, farm, hunt and live from. That's why we introduced the Bad Boy Buggies Work Series. Engineered to maximize productivity and stand up to the daily grind of property upkeep, the Work Series offers three different models for all kinds of tough jobs. 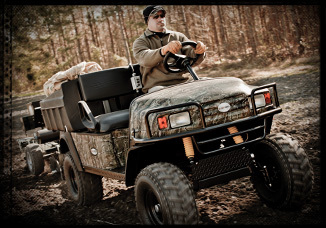 Whether you need to move the crew with the agile LTO, a 2WD model with seating for four, tend to a food plot with the versatile HD, with its 9.6-cubic-foot cargo bed and ample towing power, or tackle the toughest loads and terrain with the four-wheel-drive diesel-powered XD, there's a Work Series vehicle to handle nearly any land management challenge.